Brad Carlson here again. I’m a doctoral candidate in the midst of my fifth and final year with the Langkilde Lab, where I’ve been occupied with a number of projects on amphibian (mostly tadpole) behavior and ecology. There’s one aspect of my research, however, that tends to elicit laughter or raised eyebrows: tadpole personality. Personality has been found in basically every animal that we’ve tested for it. From apes to lizards to hermit crabs to sponges (! ), we’ve found that when we measure an animal’s behavior, it often remains similar over time (i.e., consistent) and differs from others of the same species. When I began my research, no one had really looked at whether amphibians – and particularly tadpoles – exhibit signs of personality. That’s unfortunate, because amphibians offer a lot for researchers interested in understanding why personality has evolved (why doesn’t everyone act the same?) and what the larger scale impacts of personality are. So I began investigating tadpole personality. 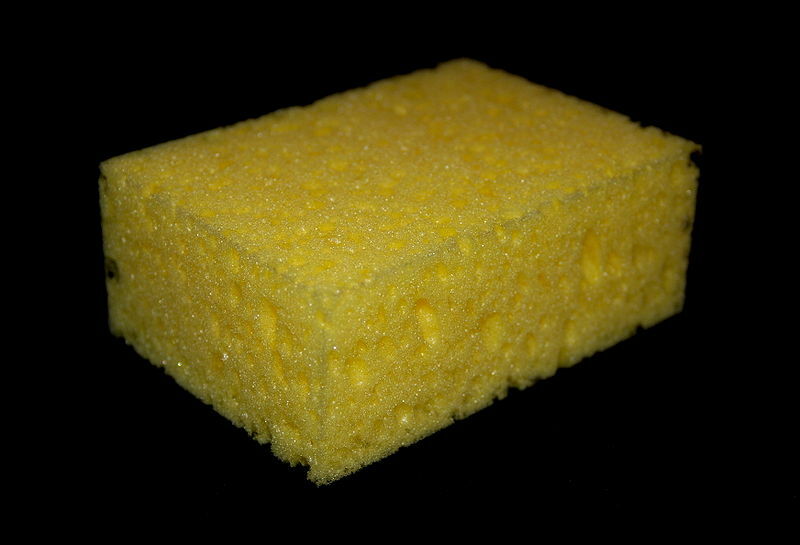 I hoped I could expect more than the personality of a sponge from my tadpoles. My goals were 1) to establish whether tadpoles exhibited consistent individual differences in behavior that can be easily measured, and 2) to determine how consistent their behavior remains as they grow from small to large tadpoles and then into frogs. My primary method was filming tadpoles in open-field trials, a standard class of behavioral measures in animal research. In general, an individual animal is placed in an open, empty environment and a variety of behaviors are measured. I focused on the distance moved in the open-field (which for tadpoles was a small plastic tub) and the amount of time they spent close to the walls of the open-field vs. in the central area. Distance moved was my attempt to measure a general personality trait known as exploration-avoidance: whether an animal shrinks away from a new stimulus or environment or whether they “explore” it. A tadpole plucked out of its familiar home environment can either explore this strange new tub (covering a lot of distance) or sit there and avoid all that novelty. The proportion of time spent in the center vs. the edge of the open-field was my measure of boldness-shyness: how risky an individual’s behavior is. A shy tadpole might be expected to remain close to the wall of the tub where it is presumably safe, while a bold tadpole should comfortably cruise around the wide open even though it is vulnerable to predators. Additionally, I also recorded the behavior of the tadpoles in their home enclosures, so that I could tell how much their behavior reflects being in a new environment (the open-field) and how much their behavior in the open-field is simply indicating their overall activity level (yet another personality trait). A tadpole in an open-field trial. I first tested this with a set of 8 bullfrog (Rana catesbeiana) tadpoles. While initially intended as a pilot test, the data was nice enough that we were able to publish it in Journal of Herpetology recently. 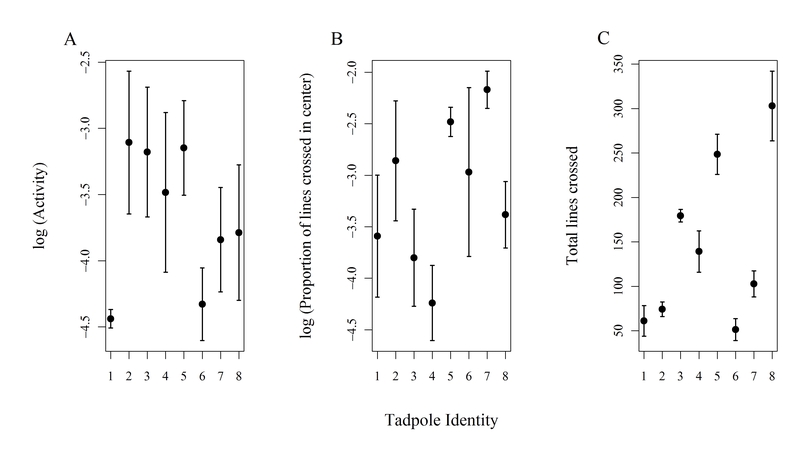 Exploration varied clearly among individual tadpoles, with some evidence indicating that boldness might vary too. In the primary experiment following the bullfrog study, I kept 50 wood frog (Rana sylvatica) tadpoles in the lab from hatching until 6 weeks after turning into frogs. During this time, I performed the same trials as above, twice at three different tadpole stages and three frog stages. Unfortunately, I don’t have much to report yet as we are still going through the 100+ hours of footage of tadpoles and carefully documenting every little movement they make. Initial looks at the partial dataset suggests that some personality traits may remain consistent as the tadpoles turn into frogs, which is supported by another recent study that did something similar (but not the same) in a different frog species. This is a bit surprising, as you might think it would make the most sense to have personalities than “start over” when they turn into frogs. A certain personality type (e.g. being bold vs. being shy) could be advantageous in the aquatic environment of the tadpole and costly in the terrestrial realm of the frog, and the brain undergoes some significant rearrangement during metamorphosis. But apparently some personality traits lie deep within the individual, so to speak. Wood frog tadpoles whose personalities were tracked throughout development. So that’s the story so far. Tadpoles have personality (more than some people, maybe), and there remains a lot to be understood. I’m still chipping away at this and trying to better understand what has shaped all this variation (one of my “dead ends” is in press …) Biologists still have a long way to go towards making sense of animal personality, but I hope at this point you are maybe thinking about tadpoles – and indeed any animal – in a slightly different way. Or maybe you won’t – that’s just part of your personality. Categories: Research in PA | Permalink.